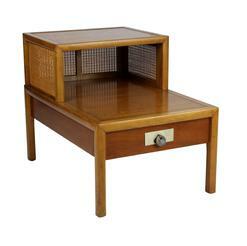 Two tier step table in fruitwood with cane panels and solid brass hardware. An occasional table as part of Baker’s New World Collection, the 2800 series. Nicely detailed piece with shaped legs and shaped rails. Cane on three sides. Soft in feel. Shallow drawer extending full length to back of case. Signature brass drawer pull in the circular style that characterizes New World. Very good + condition. Cane is completely intact. There are no breaks to the finish. Wear and use commensurate with a 60 – 70 year old piece of furniture. The literature makes no other notation of this talented and influential designer. Perhaps of further interest, were Taylor to have designed the first iteration of the Far East Collection, he would have been brought to Michigan from California.at either age 19 or age 20, with the collection introduced when he was 20 or 21. This is a risk Hollis Baker was unlikely to have undertaken.